The fact is nobody quite knows. There are various estimates on the exact number of poor in India, and the counts have been mired in controversy. This week the Planning Commission said 29.8% of India's 1.21 billion people live below the poverty line, a sharp drop from 37.2% in 2004-2005. (This means means around 360 million people currently live in poverty.) But one estimate suggests this figure could be as high as 77%. The problem, believe many, is that the new count is based on fixing the poverty line for a person living on 28.65 rupees (56 cents/35p) a day in cities and 22.42 rupees (44 cents/33p) a day in villages. This was lower than last year's recommendation by the Planning Commission to set the poverty line at 32 rupees (65c/40p) a day which stirred up a major debate across the country. Last year activists dared the head of the country's planning body to live on half a dollar a day to test his claim that it represented an adequate sum to survive in a country with high inflation and leaky and shambolic social benefits. They concluded that the claim appeared to be grossly unfair and scandalous. In India, poverty counts are based on a large sample survey of household expenditures. In other words, they are based on the purchasing power needed to buy food with some margin for non-food consumption needs. The fresh decline in poverty - rural poverty has declined faster than urban poverty during the latest period under review - has been attributed to the government's increased spending on rural welfare programmes. If this is true, it is good news. But whatever the figure is, the number of poor in India remains staggeringly high. And, what is more worrisome, demographics and the social character of the poor do not appear to be changing. Labourers (farm workers in villages, casual workers in cities), tribespeople, Dalits (formerly called low caste untouchables) and Muslims remain the poorest Indians. Almost 60% of the poor continue to reside in Bihar, Jharkhand, Orissa, Madhya Pradesh, Chattisgarh, Uttar Pradesh and Uttarakhand. Significantly, 85% of India's tribespeople and Dalits live in these states. Most agree that India has reduced poverty - from 55% in 1973-74 to 29.8% in 2009-2010, if the recent figures are correct. But it is not happening fast enough, considering India's reasonably high rate of economic growth. "High growth, though essential," says the India Development Report, "is not sufficient for poverty reduction on a sustainable basis." If the demographics and social character of the poorest in India is not changing rapidly, what is wrong? Economists like Arvind Virmani believe that bad governance, misplaced priorities, unchecked corruption and a huge failure in improving the quality of public health and literacy are to blame. All of this is correct. More importantly, does all this happen because the Indian state is inherently anti-poor? PS: The government's flip-flop over poverty count continues. On Thursday, PM Manmohan Singh told reporters that a "fresh [technical] group has been set up to devise a new method to assess the number of poor". Minister for Planning Ashwani Kumar echoed the sentiment saying there was a need to "revisit" the methods of counting the poor which would be "consistent with current reality". So yes, we still don't know who are the poor in India. 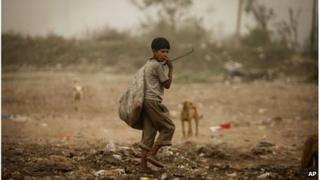 Is India's poverty line of 65 US cents a day fair?